This past weekend, I conquered the 2014 Inaugural runDisney Glass Slipper Challenge. Disney Princess weekend is a runners dream come true, where you can run at the most magical place on earth while accomplishing a goal. This weekend celebrates runners of all ages and levels and is my favorite runDisney race weekend of the year. You see so many groups of women, from those having a girls weekend, to bacherlorette parties, and even mother daughter teams. It's truly a weekend of celebrating women and I was honored to be part of it. 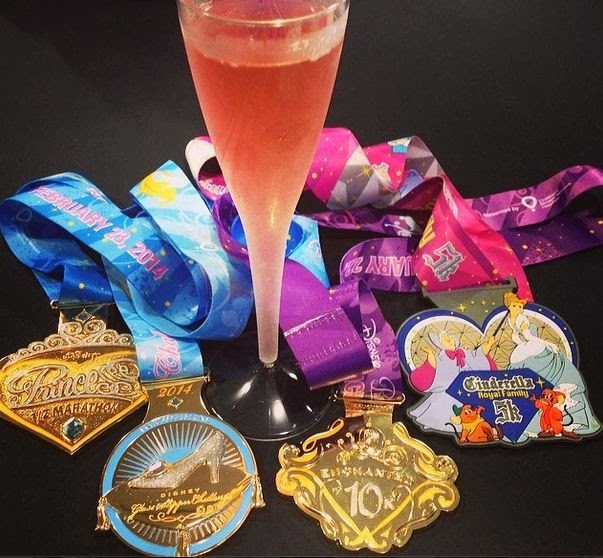 The Glass Slipper challenge consisted of 19.3 miles over two days, starting with the Enchanted 10K on Saturday and finising with the Princess Half Marathon on Sunday. Upon completing the challenge, you received a special medal to showcase your accomplishment. When this race series was announced in 2013, my best friend and I instantly signed up during Annual Passholder early registration week and my Mom offered to pay for my race entry as my birthday present. Best birthday present ever - thanks Mom! Keri and I woke up a bit exhausted. Instead of going to bed early the night before, we went to an Orlando Magic game and had an amazing time. While we paid for it on Saturday, it was well worth the exhaustion. If you read this blog, you know I LOVE the 10K at Disney World. I do not mind the first 3 miles on open road....it has a strange sense of calm to it before you enter Epcot and Boardwalk Disney. I loved watching Keri experience her first 10K at Disney - while she has ran a few runDisney 13.1's, this was her first shorter mileage course. She also loved every moment of it. You can read my full recap of the Enchanted 10K here. So if you read my review on the Princess Half, you know not only how much this race meant to me, but also know I had a breakdown. 2014 Princess Half weekend was my 2 year running anniversary - I ran my first 5K during Princess Half weekend at Disney in 2012. I made a commitment then to run the Princess Half the following year but ended up on vacation and ran Rock n Roll NOLA instead. Princess Half was the final medal I needed to complete my FL runDisney collection. While I had an absolute blast with my best friend (with the exception of the 2 miles I gave her a silent treatment), I can honestly say this was one of the most difficult mental challenges I have had since I began running, tougher than the Dopey Challenge last month. It had nothing at all to do with the course or runDisney - I have ran this half marathon course three times and can tell you the route in my sleep. Princess Half was an amazing experience and lived up to my expectations. I believe the breakdowns were due to being burnt out. You can read my full recap of the Princess Half (and my breakdown) here. On a positive note, I must take a second to tell any female runner that Princess Weekend at Disney is a MUST do (and if you are a male runner, you get to see thousands of women in tutus running). Glass Slipper Challenge is an amazing 2 day event that is an achievable goal and you get to run two different courses, receive 3 medals and 3 race specific shirts. Back to the breakdown - When I stated above that I had a difficult time with the half marathon it has to do with self abuse, under training and taking on too many races in 4 months. When I ran the Royal Family 5K on Friday (not part of the Glass Slipper Challenge), I felt as if I was living in Groundhog Day. My mind and body started a protest. Around mile 9 of the half marathon I looked at Keri and proclaimed "I quit". She thought I meant right then and there and gasped at me. I explained that I wanted to quit running. Mind you, an hour later, I was discussing what my next half was going to be. I'm in a love hate relationship with running at the moment and I believe it is due to taking on too much from November to February. As of this exact moment, I can officially state we do not have any races on the schedule. It is the first time in two years that those words have come out of my mouth. Yet don't let that fool you - I am actively trying to figure out the next race on our calendar! Do yourself a favor and sign up for the 2015 runDisney Princess Half Weekend. Make this your next goal - either your first 5K, first 10K, first Half Marathon or your first distance challenge. Two years ago, when I completed that first 5K at Disney during the Princess Half weekend, I only dreamed of running a half... Today, I have 2 full marathons, 8 half marathons and countless other distances under my running belt and I owe 100% of it to runDisney! runDisney 2014 Wine & Dine Half Marathon opened up for early registration this week for Annual Passholders and DVC members - click here for the link. It will open to the public next week so make sure you are receiving registration emails from Disney. While Princess Half weekend is my favorite runDisney "weekend", Wine Dine Half is my favorite runDisney half marathon. I love the course, I love nighttime races and I love running for wine!